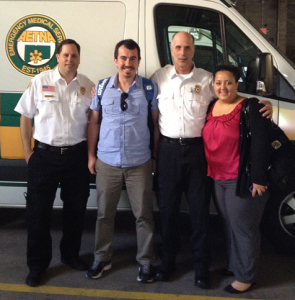 HARTFORD — On June 26, 2012, Fatih Belgin from Istanbul’s Metropolitan Municipality – Istanbul Fire Department in Turkey was at Aetna Ambulance to shadow an ambulance crew, tour facilities and observe 911 calls. 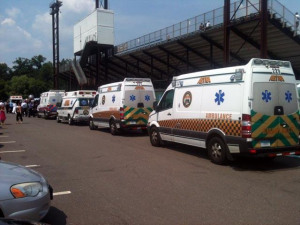 NEW BRITAIN — On June 29, 2012 multiple ambulances from Aetna and ASM were requested to Rock Cats Stadium in New Britain for a report of multiple patients suffering from heat exhaustion. The stadium was the venue for a graduation exercise at the time and due to 95 degree temperatures, many in attendance were displaying signs of heat related illnesses. 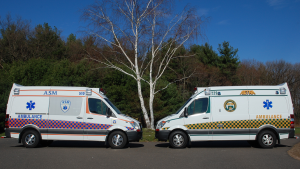 Aetna and ASM had up to six ambulances and two paramedic units to assist New Britain EMS. Why did I get two bills, one from the ambulance service and one from the paramedic service? Many patients and families express confusion over the concept of a ‘Paramedic Intercept’ and wonder why many health insurance companies, including Medicare, will not pay for such a service. 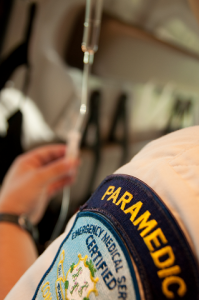 A Paramedic Intercept is a service provided during a medical emergency, most often in a rural area, where the ambulance operated by the patient’s town is staffed with EMTs. 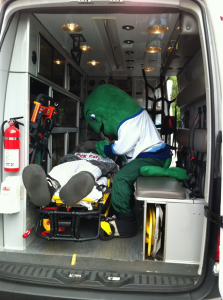 EMTs provide what is called Basic Life Support (BLS) while paramedics provide what is called Advanced Life Support (ALS). MANCHESTER — On June 10, 2012 the Ambulance Service of Manchester sent a 2012 Mercedes Sprinter Ambulance to the Touch a Truck event at the Lutz Children’s Museum in Manchester. 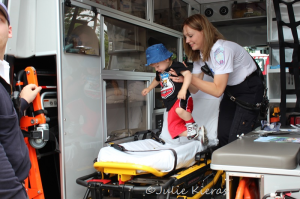 The display encouraged the kids in attendance to climb aboard, see and touch the EMS equipment and sit on the stretcher. ASM’s distinctive checkered pattern and bright colors brought a lot of attention and allowed us to compete with the Big Boys (like MFRE Engine 4). ASM’s Casey Chubka and Nick Chasse provided ambulance tours and the entertainment for those in attendance, giving out coloring books and posing for pictures. Casey’s picture and details about the event showed up on a parenting blog about the event. Click ‘continue reading’ to see more photos. MANCHESTER — On June 11, 2012 a Paramedic crew from the Ambulance Service of Manchester attended Washington School’s Annual “Fun Day”. The Manchester elementary school and the PTA hold the event to celebrate the close of each school year. ASM’s Vinnie Maston and Jason Bak were a hit last year, autographing ASM coloring books for the students and giving tours of the ambulance. 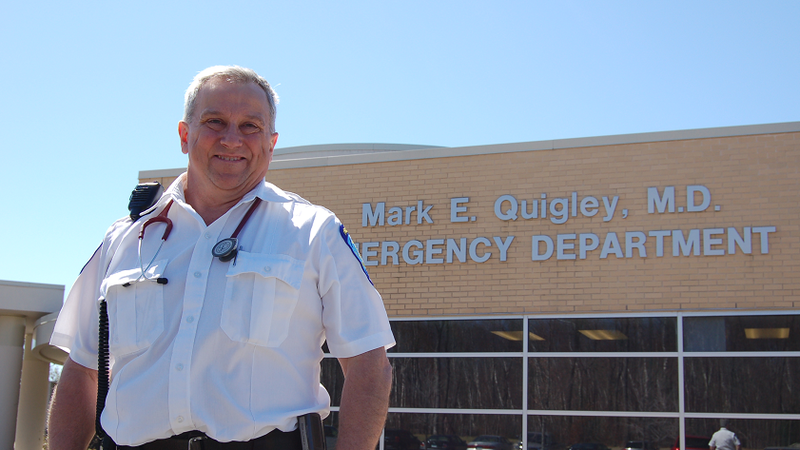 This year Vinnie, a Supervisor and Paramedic returned with fellow Supervisor and Paramedic Mike Panciera. Representatives from Manchester Police Department and Manchester Fire Rescue EMS were on hand to round out the public safety services in Manchester. 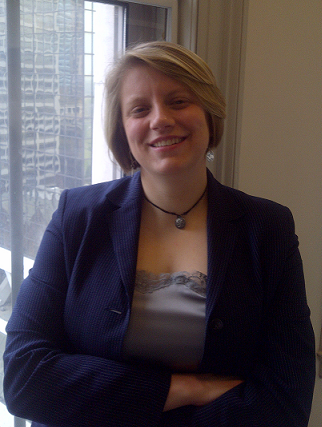 HARTFORD – As of January 11, 2012 Ambulance Service of Manchester’s Beth Sheils became Capital Community College’s Paramedic Program lead instructor for the night program. In this role, Beth leads didactic instruction for the 18-month program, guiding 20 paramedic students through extensive education and training in the delivery of emergency medical care. Hello Family and Friends. It has always been a goal of mine to do a triathlon for a good cause. And this year, I am swimming, biking and running to raise funds for the Leukemia & Lymphoma Society’s Team In Training (TNT).